Outside view of our building. 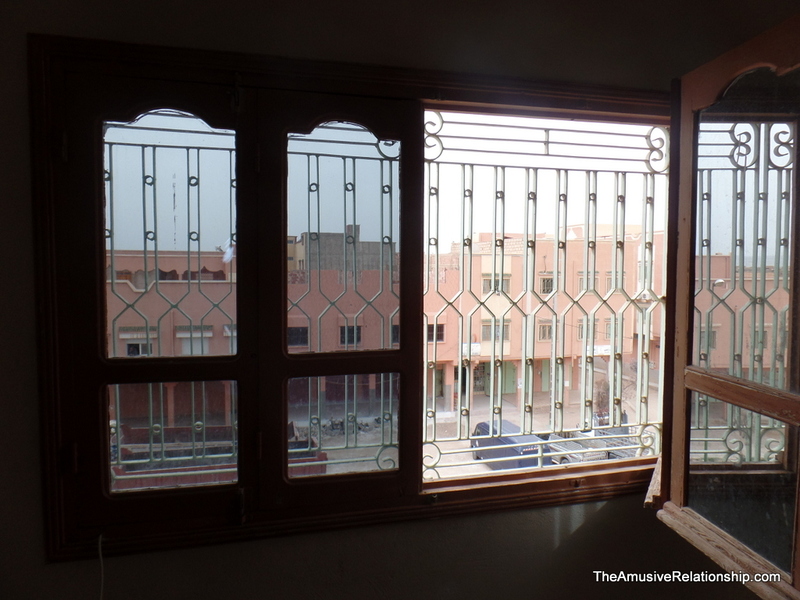 Since Erika and I are finally in our own home, I decided to write a post about a typical Moroccan home for the folks back in the US and Canada to give them some insight into the often subtle and sometimes profound differences we have noticed. Granted, we have only been here for about three months, so take this all with a grain of salt, as they say, but I think we have a pretty good basis to make some broad generalizations. First and foremost, let me say that Moroccans strike me as very practical people. Sure, there are some with more resources who have more Western-style homes, but for the most part, the average Moroccan house is designed for simplicity and economy. They are much less expensive to build and maintain than an average Western home. Generally speaking, unlike Washington State or British Columbia, Morocco does not have a good supply of timber. Native trees are smaller and less straight, so lumber must be imported. Because of this, most home are built with more readily available materials. Traditionally, at least in drier, warmer climates, this meant bricks made of a mixture of mud and hay. Many of the smaller villages in southern Morocco still use these technique. Below is a brief slideshow showing some traditionally-built buildings, among them a mosque. In colder, wetter climates, but also within the more modern cities of the south, much of the construction is done with modern bricks covered with cement. In the image on the left, notice the bricks of the inner walls. These will soon be covered with cement like the building further in the distance which is waiting to be painted. Aside from cost, there is another benefit to earthen homes – there is a considerably lower risk of fire. In fact, we saw a fire a few weeks ago billowing out of a window down the street. But, within a two weeks, they had the place cleaned up and livable again. The structure itself was unharmed. Only the personal belongings were destroyed. There are drawbacks, however. 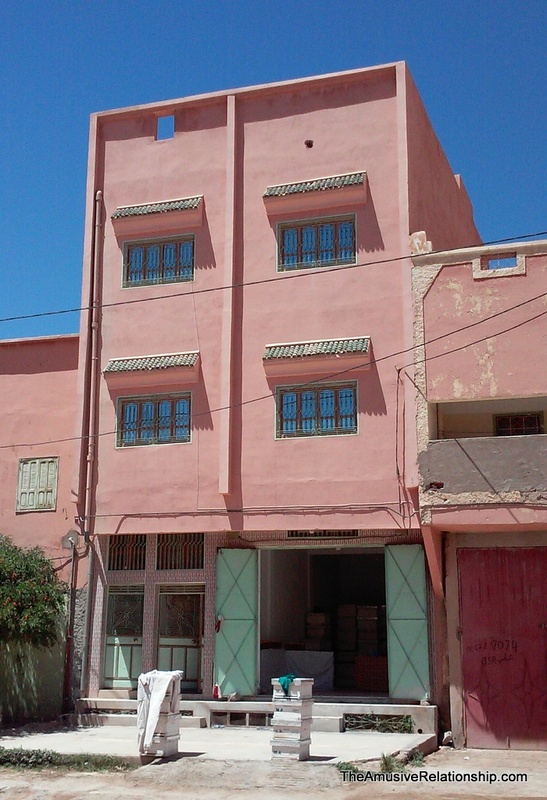 Unlike the average American home, the typical Moroccan home does not have either heating or air conditioning. Most of the time clothing is just added or shed depending on the need. With temperatures in the desert sometimes reaching 50° Celsius (that’s 122° for folks back home), from what we hear, earthen homes tend to hold the heat in the summer and resist warming in the winter. Summer is coming, so we’ll report back on this one over the next few months. Where Western homes tend toward wall-to-wall carpeting, Moroccan homes tend toward hard impermeable surfaces with occasional carpets for each room. Being in the desert, this is especially important as dust finds its way through every crack and crevice. It’s not long before a fine film develops. But, with the entire home having a concrete underfloor with sanded aggregate made to look like tile, cleaning is done (usually weekly or bi-weekly) by buckets, mops, and squeegees. Now, at this point, one might be thinking, “What do you do with all the water?” Well, homes come with a central drain, usually in the kitchen, and sometimes several drains spread throughout. Whatever water is sloshed onto the floor is simply pushed toward and down the drain. Or, depending on the home’s arrangement, down the stairs and onto the street where, at least temporarily, it helps to keep down the dust. 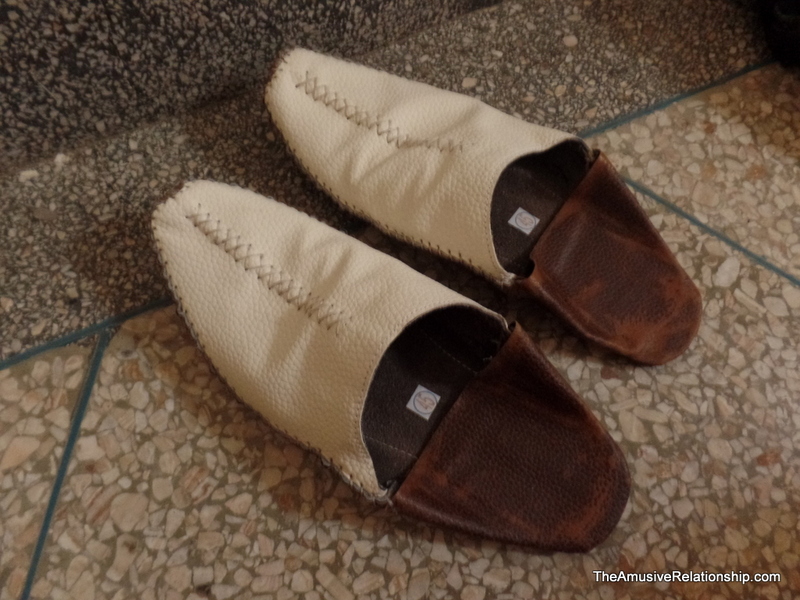 Eventually, we hope to acquire some carpets to soften the walking about, but for now, I have my wonderful Moroccan slippers. Moroccan outlet with light switch. Brick and cement are also quite malleable materials. Need to run a pipe into the next room? Just punch a hole, then patch it up. Need to add some wiring to a new outlet? Just carve out some of the wall, run the wire, then patch it up. Morocco runs on 220v and uses the Euro plug. Most outlets are ungrounded and use just the two prongs. 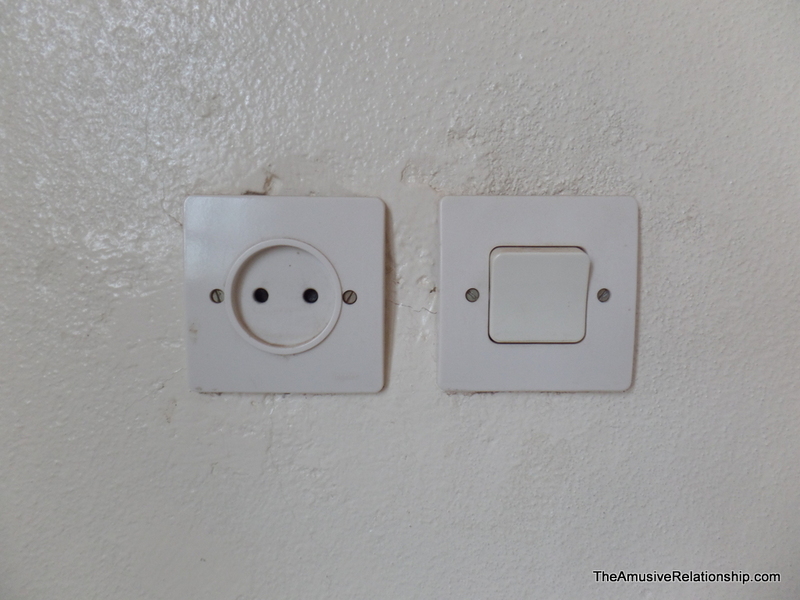 Unlike the US, outlets and switches are often the same height on the wall, usually about a meter off the floor. 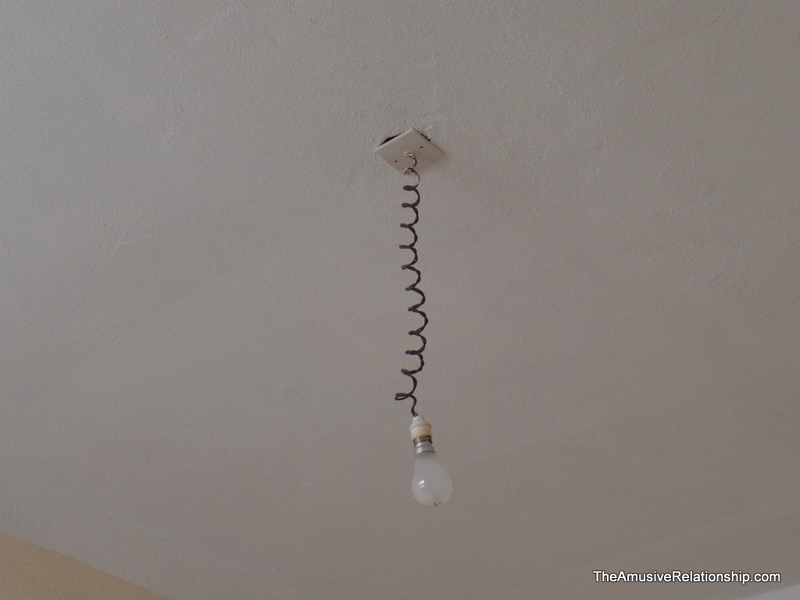 Basic light fixtures are simple – wires come from the ceiling and are coiled so that they hang into the rooms. At the most basic level, this allows for inexpensive light, but it also makes for simple upgrades should one want to install a chandelier or other fixture. 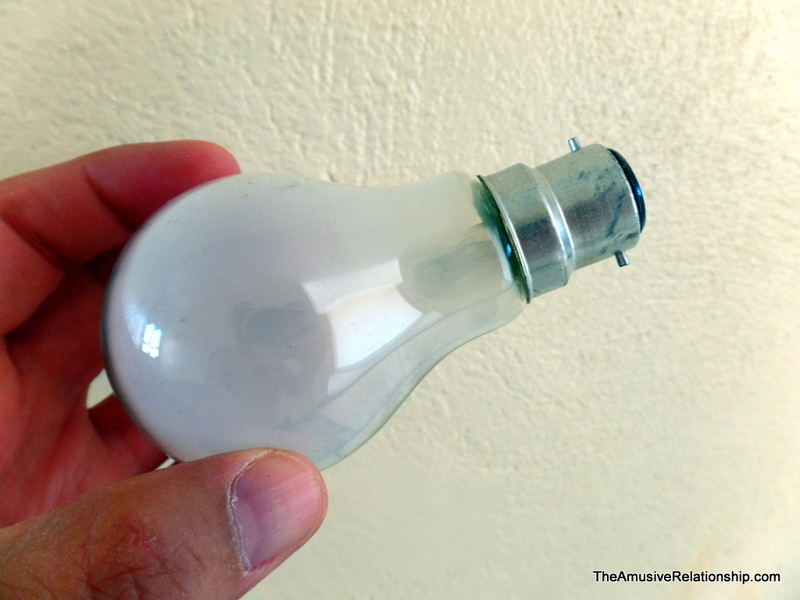 Unlike the US, which has recently moved toward phasing out incandescent light bulbs, they are still the primary source of light in Morocco, though, more and more compact fluorescent bulbs are being made available. Also, light bulbs here do not screw in. Rather, as in the image to the right, they push in and have two pins that lock it into place. From what we have been led to believe, electricity is expensive in Morocco. Unlike Turkey, which makes extensive use of its solar capabilities, we have not seen much in the way of alternative energy generation such as solar or wind power during our travels thus far around Morocco. Because of that, it is used sparingly, mostly for lighting and small appliances, such as small refrigerators, clothes washers, mixers, blenders, and the occasional microwave. That being the case, most of the cooking is done by gas. However, this is not your Western version with natural gas piped in. Most rural homes employ propane systems call buta gaz. It’s much like what Americans would call camping, but at home. Essentially, each home has one or more propane tanks set up at various locations for different purposes. There are cooktops used much the same way they are used in the States, with the addition of tajines, and small, freestanding ovens used mostly for breads. We have a larger tank under the counter setup to run the cooktop and a smaller tank for the oven. 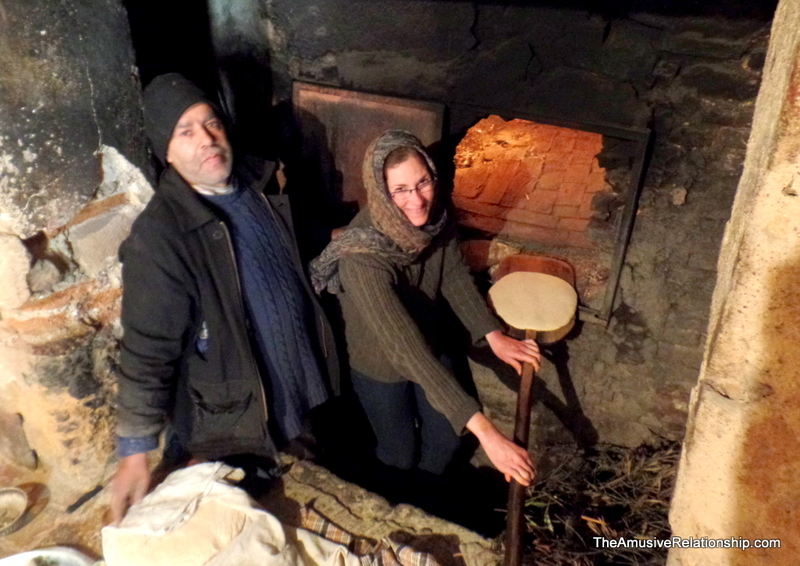 Some older communities, such as Moulay Idriss Zerhoun, still use systems of community ovens. There is one in each neighborhood for homes to outsource some of the time-consuming baking tasks. During our time in that city, we came to know the baker quite well. He and Erika bonded over their shared love 70s disco. On the left is an image of them baking together. 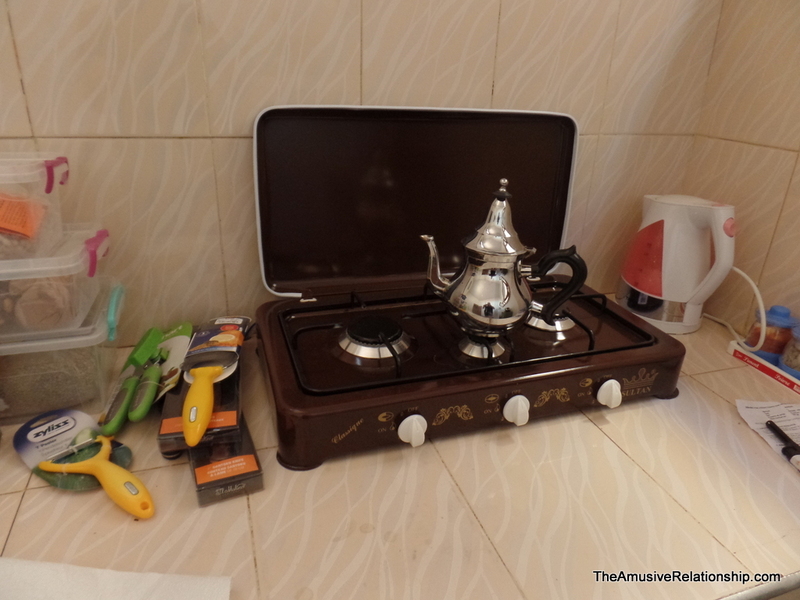 Bathrooms in Morocco are quite different than in the US and Canada, though there are some similar elements to what we saw during our trip to Eastern Europe last autumn. 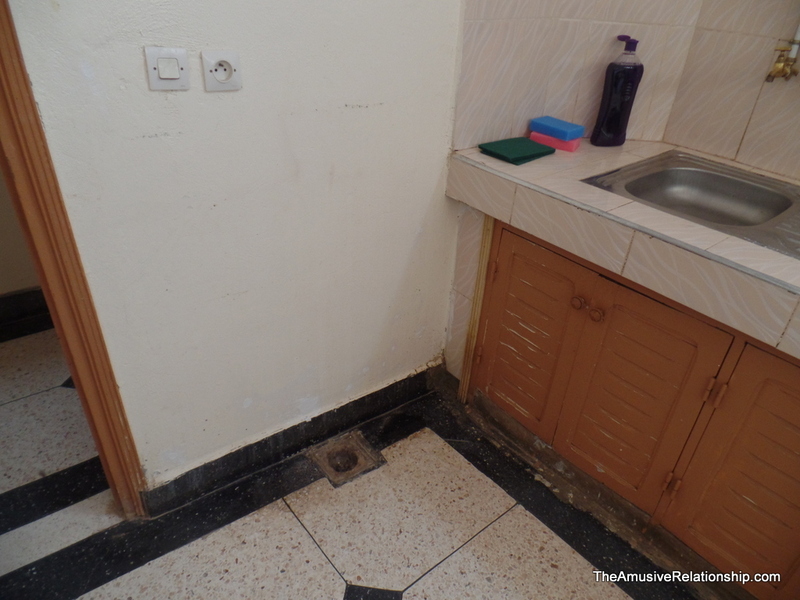 Whereas bathrooms in North America tend to be compartmentalized, ones in Morocco all-in-one. Our main bathroom, seen here on the right, is no different. Perhaps, the most noticeable feature for Westerners is the standard Moroccan squat toilet sometimes called a Turk. One puts his feet on the two raised areas, squats, and voila! Flushing is done by bucket, so there is always one nearby, usually under or near the faucet. Toilet paper, or papier génique, is not always available or, sometimes, not recommended for older plumbing, so cleaning up afterward is done by hand with water. Out of sight to the right is the hand sink. Our gas hot water heater. The toilet acts as both the waste receptacle and the shower drain. Usually bathrooms have a squeegee available to help reduce the amount of water on the floor. Out of view to the upper right is the handheld shower head. 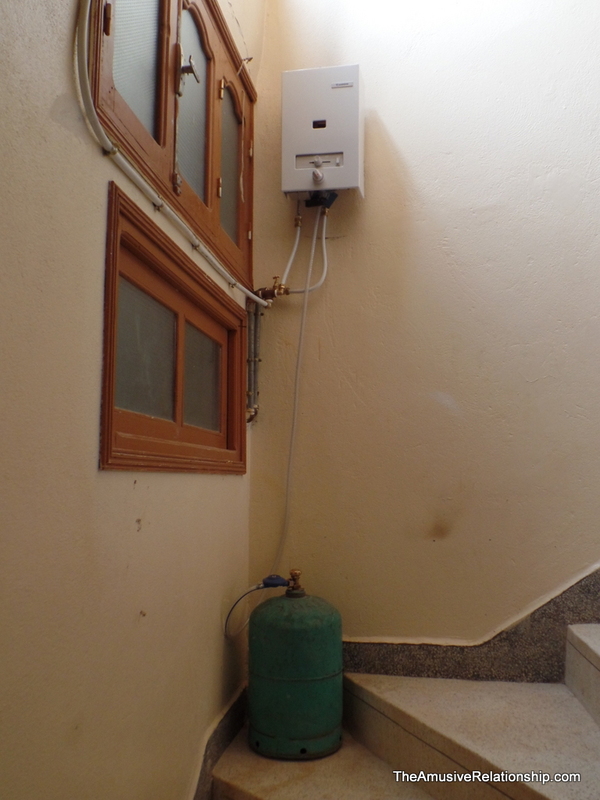 Like most European showers, ones in Morocco are usually handheld, or at least have it as an option. Usually, there are only showers, no baths, except for more expensive homes. 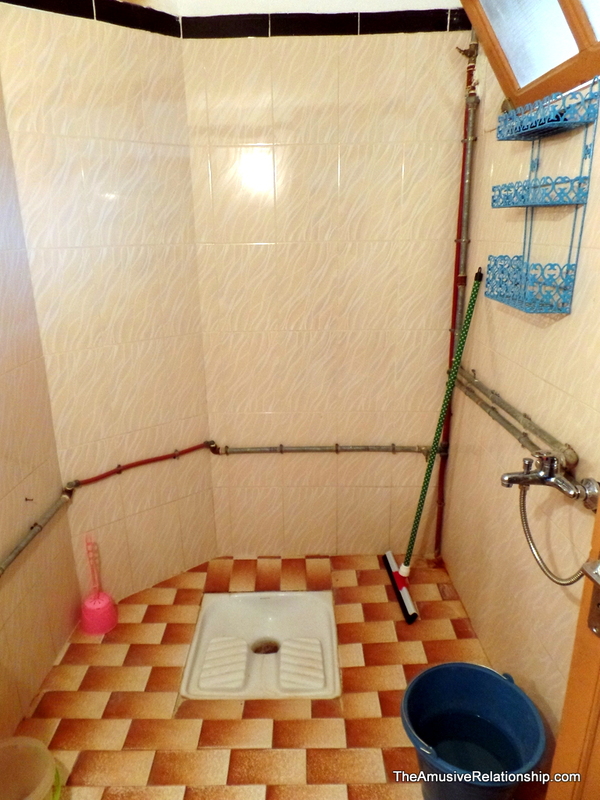 It’s not unusual to have exposed plumbing, as you can also see from the photo. This makes modification and upgrades easier. 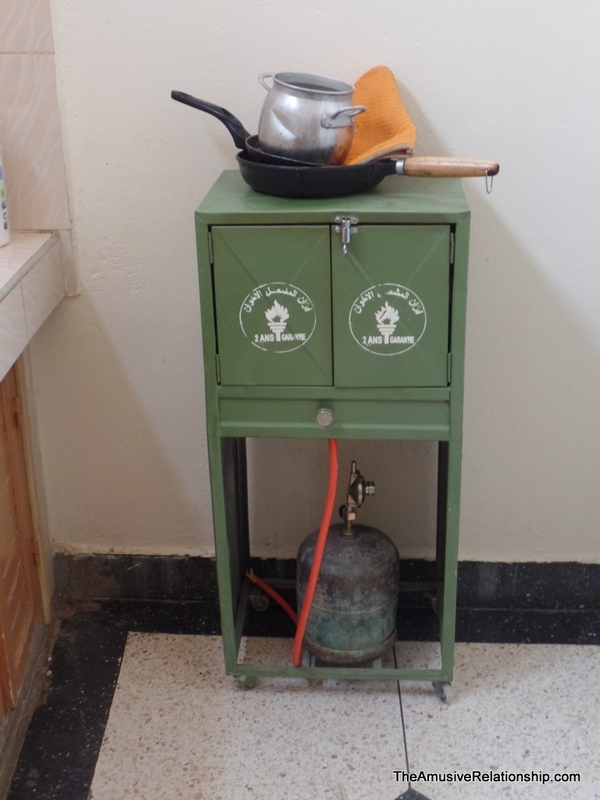 Speaking of showers, plumbing, and buta gaz, on the left is our propane-powered water heater, locally called a chiffur. It’s an on-demand water heater that has been plumbed into existing systems to provide hot water to the bathroom and kitchen. Barred windows are the norm. Relatively speaking, Morocco is a very safe country. Violent crime statistics are much lower than the United States. Yet, to Western eyes, it would seem much higher. Every home comes with barred windows, but that does not mean they need to be ugly. One of the more amazing art forms, if one chooses to see it that way, are the tremendous variety of window bars. Usually, each building’s are handmade and unique. Walking around our town, no two are alike. Some, like ours, have such incredibly intricate designs it’s easy to forget they are bars. Even between floors, like in our apartment building, there are bars to prevent access to other apartments. 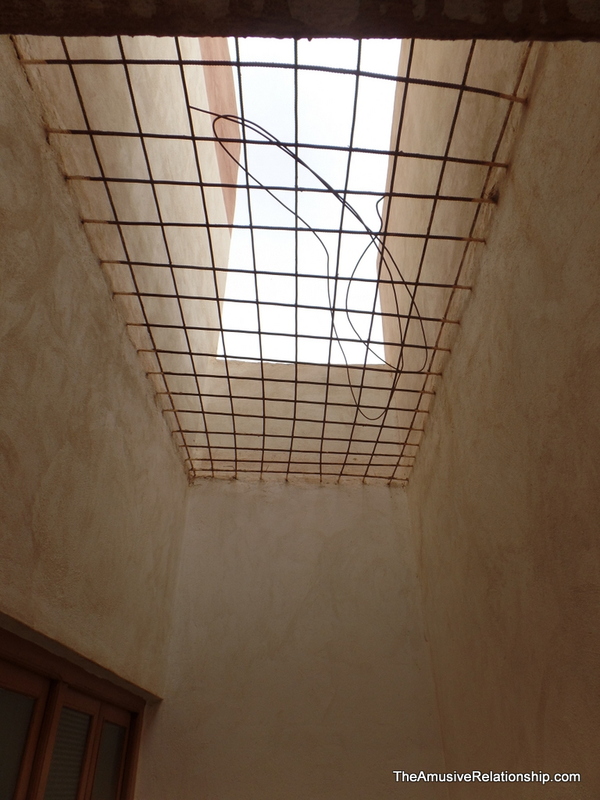 Here, you see a grating spanning the light shaft shared by the lower level. 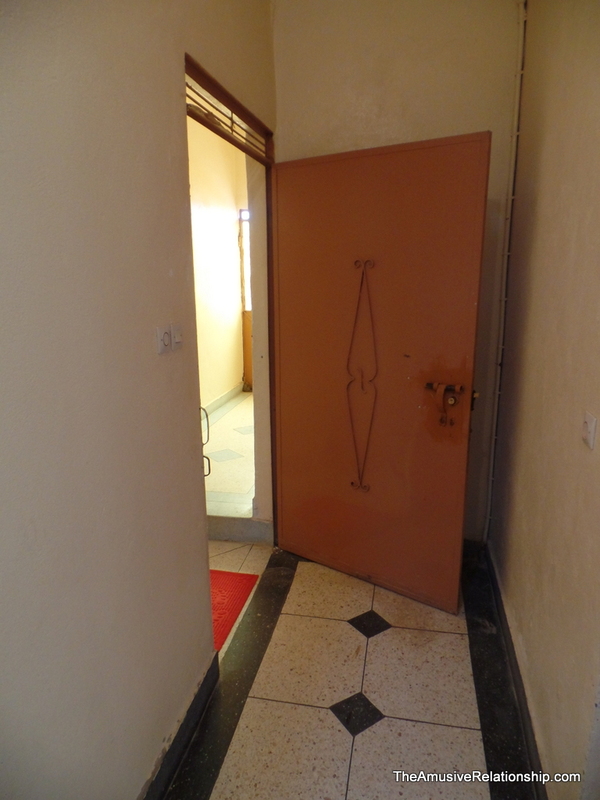 Except for within the home, all doors are made of steel and have several means of being made secure. Ours has both a key lock and a sliding bolt that can be secured with a padlock should we leave on vacation. 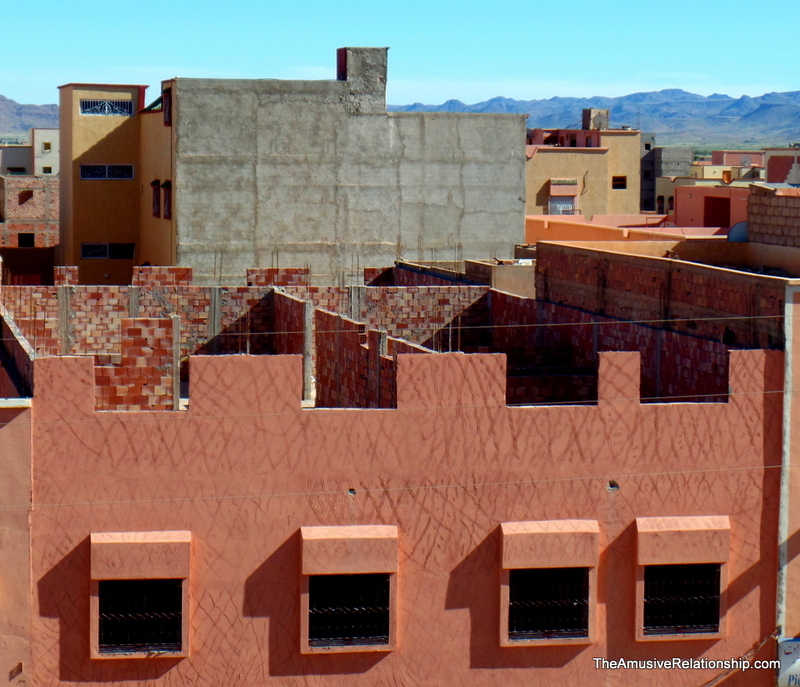 With Morocco being predominately a warm, arid climate, roofs, or terraces, are a must. Not only are they required for drying clothes, but in the brutally hot southern areas, many people sleep there in the evenings to escape the heat of the house. Our somewhat new washing machine setup on the roof. 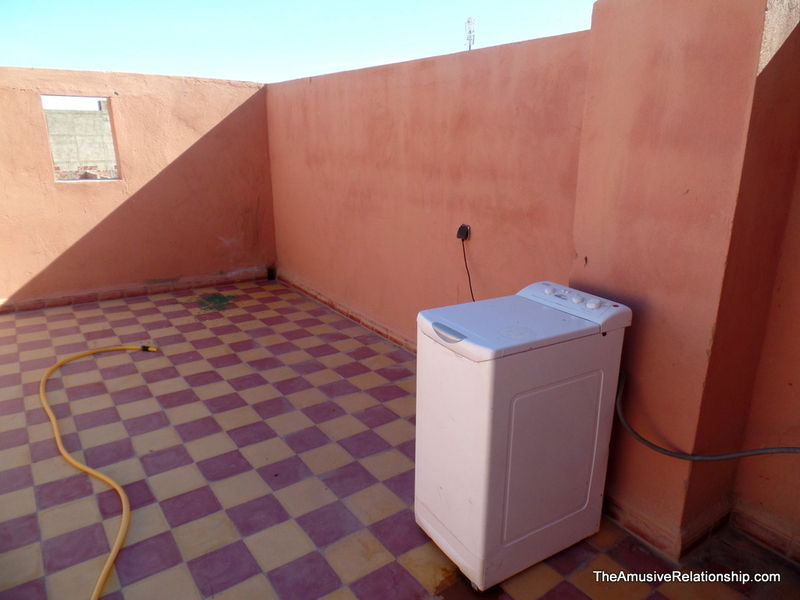 In our area of the country, since it rains so little, we put our clothes washing machine on the roof both to make it easier to hang and to free up otherwise crowded space in on of the bathrooms. Drying is always done by hanging. We have yet to see a home with a dryer, though I’m sure they exist. It makes me think about the tremendous amount of energy the average American home uses with its clothes driers and ovens, not to mention the always-on hot water heaters. All in all, I love the simplicity of Moroccan living. It’s incredibly practical and there is very little waste. In many ways, it makes me question the American mode of living with its focus on ease. What we think of as simple, is often quite complex when compared to Moroccan living. However, with the cost of electricity beyond the means of average people, I would love to see some bolder movement of behalf of the Moroccan government into the fields of alternative energy. Morocco more progressive; I am not allowed to dry my clothing on my deck in my condo. Thanks for the tour. Very interesting to a city planner. Great insight into how things work. Economy of effort and resources seem almost foreign to most of us. And my guess is that one develops really strong quads with the variety of bending/squatting/lifting, etc. that your life requires. I’m going to start working mine for my visit next year. . Thanks for the whole tour, I have a better sense of what your lives are like in your new home. Great post, Tom. Fascinating, informative and very well written. Keep ’em coming. Best to you and Erika. Thanks!. We’re loving our new place. Bought a pied-a-terre in Tangier last year, things are quiet different from what you’ve described though. As a New Yorker, it is surprisingly easy to live here, Summer & winter. May be because Tangier is closer to Spain? Would love to exchange notes! Certainly, there are more modern dwellings. 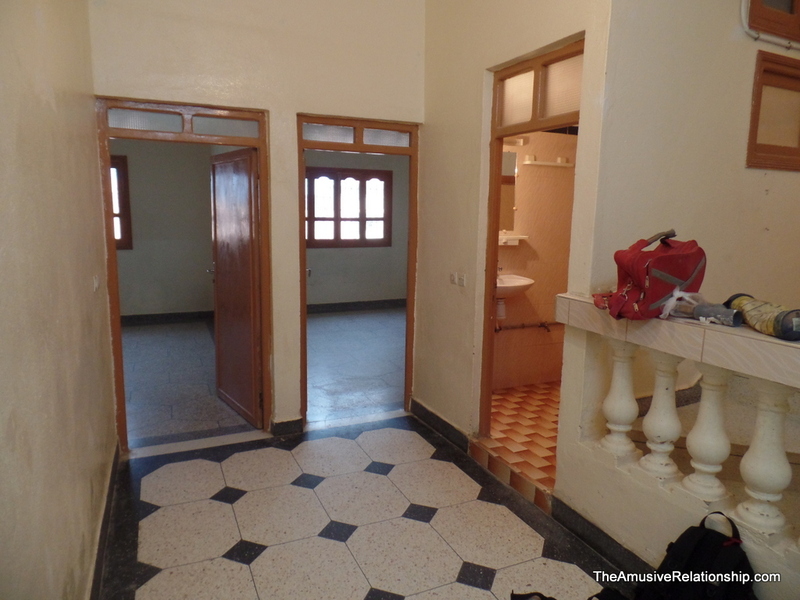 In fact, I now live in a more modern apartment in Casablanca. However, once one leaves the major cities, what I describe is common. Indeed. I’ve lived in Morocco for three years now and love it. I’ve lived in the mountains, in the desert, and in Casablanca.